Remember the countless times you almost hit the target when treating for pests--ants, drain flies, spiders, but once sprayed, the liquid ran in the other direction, or couldn't reach the nest because the equipment simply couldn't carry the product into the target zone? ProFoam Platinum a biodegradable foam formulation—designed to reduce water, time and money, allowing companies successful treatments –responsibly leaving a safer chemical footprint. Water usage is a global concern—conservation of this precious commodity is everyone’s concern. 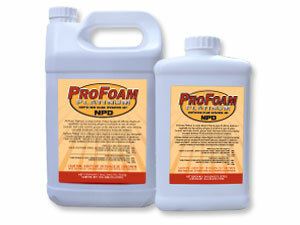 Mixed correctly—ProFoam Platinum decreases water usage-- anywhere from 4 to 18 times less. ProFoam is a thick non-ionic, substantial foam that plays well with all insecticides, biocides and even some fertilizers. ProFoam stacks up like nothing else, travelling immediately into cracks, crevices, under concrete slabs, wall voids, vertical and horizontal surfaces-- all places that are known harbourages for pests. When mixed according to the directions on the label and on the insecticide label, ProFoam gets to the target where liquid treatments can not go. 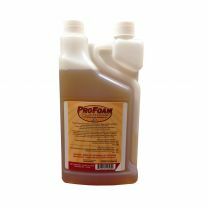 ProFoam Platinum is a non-toxic blend of surfactants and adjavants. Use it to complete “Green Treatments” in conjunction with NPD’s other “Green” products; BIOPlus and Vital Oxide and increase their reach and effectiveness. ProFoam Platinum has not been formulated using any compounds listed in the current California Prop 65 Bill. 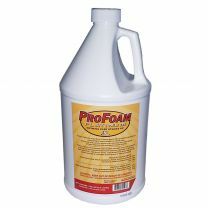 ProFoam Platinum, an industry standard has been independently tested by major chemical manufactures and was found to “play well with others” as it is compatible and non-repellent. Foam is listed on their labels as a recommended treatment procedure. When mixing ProFoam Platinum to other chemicals follow all mixing instructions on chemical manufacturer’s label, adding ProFoam Platinum as directed. ProFoam Platinum rates will vary depending on chemical and equipment used. ProFoam Platinum Foaming Agent affectively delivers your chemical of choice, penetrating deep into areasand covers surfaces. . ProFoam Platinum goes the distance to supply the highest quality performance with low environmental impact. ProFoam Platinum can be used everywhere: Pest Control, Sanitation, Construction, Manufacturing, Turf Industry, Food Processing, Automotive, Poultry and Horticulture.